Our clients enjoy coming in on a regular basis to review their financial situation and share their life stories. New clients come to know they are not an account number to us. Rather, they are an integral part of our family of clients. Our focus is on listening, understanding and caring about our clients’ concerns. To customize our client experience, we have 3 ways we can work with you. It’s important to note that all three of our service levels include investment management. The first service level is core investment management. Some of our clients only want investment management and no financial planning. We do not provide detailed retirement or financial planning analysis for this service level, but we will always try to help answer your questions. Click on this investment management only link for more detailed information. 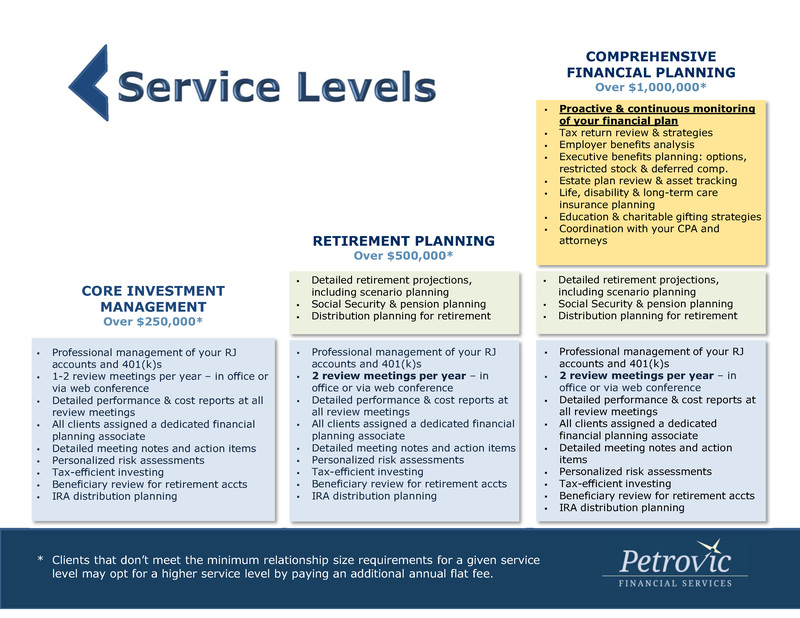 The second service level is retirement planning. In addition to investment management, we provide you with detailed retirement projections that incorporate your expenses, investments, Social Security and any pensions or other income you might have. We also ‘take the extra step’ to analyze various scenarios for you. Based on your situation, these could be different life expectancies, maximizing your Social Security benefits, various pension payment options, paying off your mortgage, or self-funding a long-term care event. We monitor a client’s retirement by doing a retirement projection every few years, or more frequently if a client’s situation changes. This contrasts with some advisors who only run a retirement analysis once…at the beginning of the client relationship. Click on this retirement planning link for more detailed information. The third service level is comprehensive financial planning. In addition to investment management and retirement planning, this service level includes money saving tax strategies, estate planning, education planning, budgeting and cash flow and employer benefits. At least one meeting a year will be dedicated to a deep dive into one or more financial planning topics. Together, our advisors proactively determine which financial planning topics should be reviewed. As with retirement planning, we monitor your financial plan by reviewing each area every few years. Life changes, and so should your financial plan. Click on this comprehensive financial planning link for more detailed information. Note: Clients that don’t meet the minimum relationship size requirements for a given service level may opt for a higher service level by paying an additional annual flat fee.